SWIRL! SIP! STROLL! Grab some friends and go on a wine tasting adventure of local wineries at downtown Bellevue merchants on Old Main. Meet the winemakers from 15 local wineries and sip, shop, & stroll down Old Main – the hidden gem of the Eastside that’s lively, intimate and friendly! Event is a collaboration between the Old Main Street Merchants Association and Seattle Uncorked ! Summer Sip In The Garden! Sun. June 25th, 2017 Highline Sea-Tac Botanical Garden 13735 24th Ave S SeaTac, WA 98168 3-7 pm ~ $25 CLICK HERE for tickets:http://tinyurl.com/summerSip2017 Meet Your Makers in the Garden – Wine, Brews & Ciders! We have chosen a gorgeous new venue to host this first annual event called Summer Sip at the beautiful Highline Sea-Tac Botanical Gardens. 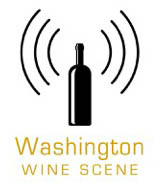 The event is a collaboration between Seattle Uncorked and the Duwamish Rotary. This event features 6 Northwest Local Wineries, 4 Breweries, 2 Cideries, and 2 Food Trucks! Featuring: Lodmell Cellars Michael Florentino Cellars Love That Red Winery Three of Cups Winery Pear Up/Niegel Ciders Schilling Hard Cider More TBS soon! https://www.facebook.com/events/1912575898988401 Wine Tasting, Cider Tasting, Beer Tasting! Something for everyone! Shamrock Shuffle Wine & Beer Walk Sat. March 11, 2017 ~ 5-8 pm Bothell’s Country Village 23718 Bothell Everett Highway $25 Advance / $30 Door Gather with your friends, bring your favorite glass, and dress in your lucky green party clothes to celebrate some of the area’s best wines and beers! 15 local wineries and select breweries will be located throughout Country Village in one-of-a-kind, locally owned shops. This popular event sells out every year! Featuring: 20 Corners Brewery Decibel Brewing Leony’s Cellar Love That Red Winery Martedi Winery McMenamins Anderson School Brewery Michael Florentino Cellars Three of Cups Wines Triplehorn Brewing Truth Teller Winery Wilridge Winery Stay tuned for complete list soon! For more info CLICK HERE! A Collaboration between Greater Bothell Chamber of Commerce, Country Village, and Seattle Uncorked. Vintage Bothell Wine, Beer, & Spirits Walk Fri. Sept. 17, 2016 5-8 pm – $25 Advance/$30 Door Get your tickets now! Taste the area’s premier wineries, breweries, & distilleries while shopping Bothell’s historic Main Street retailers. 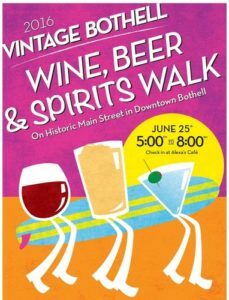 Grab your friends, bring your favorite drinking glass and head to downtown Bothell for the Sept. Vintage Bothell Wine, Beer & Spirits Walk! Check in at Alexa’s Café to get your event wristband, 10 tasting tickets, and your map to find out which shop is hosting which winery/distillery/brewery. Each shop will also have delicious appetizers to enjoy. Don’t forget to keep track of your favorites and head back to Alexa’s Café when you are done tasting to purchase bottles to take home (at discounted prices!). Must be 21 years of age or older to participate. Ticket price includes 10 tastes. Additional tastes available for $1 each. BYOG (bring your own glass). A limited supply of glasses will be available for $5 each. CLICK HERE TO GET TICKETS and save $5. Donations for the Bothell Fire Fund will be accepted at the event! Proceeds for this event benefit the Greater Bothell Chamber of Commerce’s many programs and events that work to connect businesses and community in the Bothell and Kenmore areas.